If you are a project manager – you like it or not, you have to deal with multiple meetings almost every day. Many team members do not like (read: hate) status meetings. It is a different story whether you may decide which ones to not to attend but the fact remains, meetings are important for well-organised delivery of projects. In different project meeting, as a project manager, you need to communicate with project clients, vendors, team members, sponsors, senior management and other stakeholders to discuss various aspects of project like budget, progress, cost overrun, resources, issues, plans, risks, budget, etc. These concerns can be addressed if everyone participating in meeting understands few specific things mentioned in the section below. Also as a project manager, time is the scarcest and if you have no choice but to keep engaged in meetings– you should make best possible use of it? Unless you are clear what to achieve from attending and conducting a meeting, the meeting and discussions may not lead to anything conclusive also, potentially wasting every participant’s time and energy. Thus before you schedule any meeting, ensure that you have clear objectives to achieve from a meeting. Say you want to discuss a particular issue, or project KPIs, achievement of the team, client feedback or etc. 2. Who is going to attend it? If the meeting is expected to conclude in terms of some decision, you will have to ensure that there will be a right representative – decision maker, present in the meeting. The working committee can make all useful discussion and provide recommendation, but if it is going to be a senior manager who is expected to approve it, organiser should inform him/her about it and invite them to meeting. Meeting objective can be a little broader to follow during a meeting hence you will have to mention specific items to discuss about, or decide about in meeting and that is a Meeting Agenda. It sets the path for a meeting. Meeting organizer should share meeting agenda with every participant, well before the scheduled meeting. Quite often the meeting discussion goes off-topic, sub-group of people starts discussing within themselves. As a meeting coordinator/moderator, you need make everyone to focus on the meeting agenda. Of course, quick humorous notes/comments are just fine (and at times necessary) to make the meeting environment little relaxed and healthy. There can be difference of opinions, project stakeholders may have differences, liking for one topic over other or preference for one resource over other; however it is important to focus on the concepts, ideas rather than preferences in people. Sometimes, meeting participant may tend to criticise other attendee. As a meeting organiser, you are expected to drive them to discuss about his/her concept rather than the proposer. There will be differences of opinion. And for meaningful discussion, not every time, you need to have unilateral/consensus on a given topic. As a meeting attendee or organiser, you should be able to understand and accept these differences, record these and understand what works best for your organisation and meets the goal of meeting. It is equally important to carry out post-meeting activities. Experienced organisers keep recording minutes of meeting (MoM), enlist action points with due date and assignee and share this information with all meeting attendees. As a project manager you always have plenty of meetings to attend every week, too many emails to go through and plethora of agenda to scan, MoM, action items to follow up. There is no easier way of organising all information without using central meeting manager system. 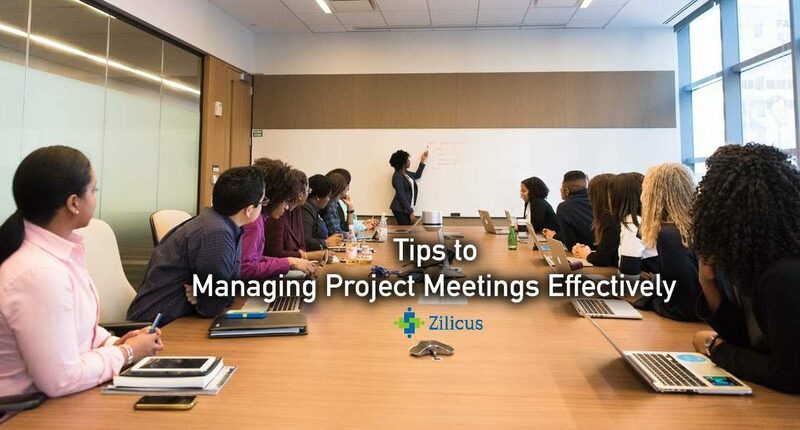 I would like to suggest ZilicusPM meeting manager– to make your life easier; you should organise and manage all your meeting through a simple, centralised, online platform. If you are using MS Project or Excel, you better switch to online project management software like ZilicusPM. More often than not, you will not have to conduct project status meeting; because as and when project team update their respective progress, it is going to get reflected in the project Gantt chart, project dashboard and project reports. Meeting is like pretty much like a drawing board and it is crucial for the successful project planning and project delivery. You should carefully plan for it, attend and organise it in productive manner for effective project management. How do you make your meeting more productive? Do share your thoughts. ZilicusPM is online project management software that offers an incredibly simple and collaborative way to manage projects. Try ZilicusPM a powerful tool to stay on top of things with aesthetic dashboard. ZilicusPM enables online project planning – WBS, online scheduling, resource assignment, Gantt chart, project tracking, issue management, online calendar, risk register and much more. Sign up for 30-days risk free trial.